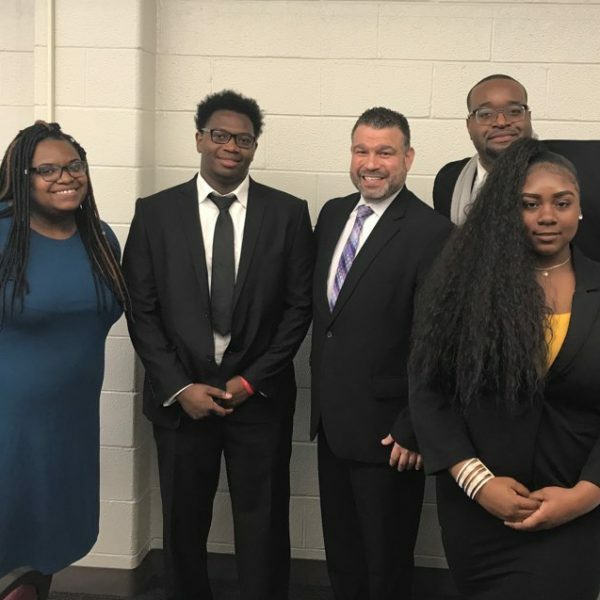 Out of School Time (OST) participants and staff recently testified before a regional public forum of Governor Wolf’s Task Force on school safety. On April 17, 2018, two months after the tragic killing of 17 people at Marjory Stoneman Douglas High School in Florida, and almost 19 years to the day after the mass shootings at Columbine High School, Episcopal Community Services staff and students joined state government, education and law enforcement and education officials, health officials, labor leaders, and other invited guests to discuss how to improve school safety in Pennsylvania. The meeting was one of several regional public forums of the Governor’s School Safety Taskforce, co-chaired by Governor Tom Wolf and Pennsylvania Auditor General Eugene DePasquale. Their stated goal was to elicit specific concerns from students as well as professionals about school safety; explore possible policy changes; and assess the level of student support, physical, and mental health programs and information sharing. Because ECS works so closely with schools, particularly in afterschool programs and other youth-related programs, we were invited to come to the forum and share our thoughts and insights on the issue of school safety. How can we strengthen efforts to address the health (both physical and mental) needs of students? How can we help ensure school buildings are secure and that appropriate training is conducted for students and staff? How can we help prepare school staff, students, and first responders to address and respond to mass shootings and threats? Our ECS students did not disappoint. A common concern was a lack of professional support. A number of witnesses spoke of the lack of sufficient counselors, nurses, or social workers. Many counselors are simply overwhelmed and/or don’t have time enough time to provide help to those who need it. “They don’t have time to deal with mental health needs,” said one. When they did get access, students still felt counselors weren’t providing sufficient attention—as a result trust is lacking. School nurses were seen in much the same way—understaffed and spread too thin to deal with so many students in need. In addition, the students noted that nurses were seldom available while before and afterschool activities were taking place. On the question of buildings, our students told the Task Force that they often felt unsafe because many school entrances and exits were left unmonitored or unsecured. “It is too easy to access this school,” a student explained. While some schools had cameras and metal detectors, the number of security guards seemed insufficient. More security guards, perhaps armed with guns was suggested by one student. “Right now we have no metal detectors—only flashlights,” another testified. Others called for more education and training about what to do in emergencies. Many schools still do not have shooting drills for students and staff. “We need shooting drills. They should be standard for schools,” several noted. An overriding theme for the day was the need for better communication—between teachers and parents, and between students and staff. In addition, our students identified the need for enhanced training for teachers and staff on how to deal with emergency situations. Working more closely in collaboration with fire and police could help make schools safer, they said. Here again, however, the problem of understaffing was raised: “Ratios for youth to teachers are way off—how can they prevent incidents and assist with so many kids?” Indeed, our student were well aware of the constraints posed by the lack of sufficient teachers. “Rations are one to thirty, or one to thirty-five—this is too many. (The ratio) shouldn’t be more than one to twenty,” they said. All in all, this was a very enlightening, as well as heartening experience for myself and our students to see so many high-level public officials were present to hear this open exchange of insights from young people who are literally on the front lines of the school safety issue. Besides Auditor General DePasquale, those present included Bonita Allen, president of the Pennsylvania Parent Teacher Association (PA PTA); Dr. Mark DiRocco, executive director of the Pennsylvania Association of School Administrators (PASA); Judy Morgitan, past president of the Pennsylvania Association of School Nurses and Practitioners (PASNAP); Derin Myers, acting executive director of the Pennsylvania Commission on Crime & Delinquency (PCCD); Dolores McCracken, president of the Pennsylvania State Education Association (PSEA); Jerry Oleksiak, Secretary of Labor & Industry; Kim Early, policy director for the Department of Health; Pedro Rivera, Secretary of Education, and Lieutenant Colonel Robert Evanchick, Acting Colonel of the Pennsylvania State Police. As you can see, that is a distinguished, high-powered group. They listened attentively and appreciatively to what the witnesses had to say. I’m happy to report that everyone seemed to be on the same page—focused on the need to determine what we can do to make sure our schools are safe and our students are not in harm’s way. In the meantime, the Task Force has several more public meetings scheduled around the state, after which they hope to develop a set of best practices to serve as a guide as we all work together to make sure our schools—and our children—are as safe as they can be. It’s clear that we all have a shared mission. And with the help of our students’ first-hand views, we are creating a positive way forward.